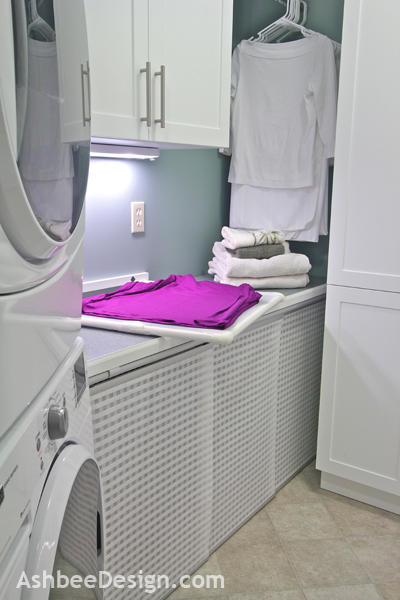 Yes, I still have more to share about my laundry room. The things that are left aren't the exciting things but the little extras. I have been getting a lot of contacts from people that are planning laundry room re-do's and seeing these extras can help in the planning. I had seen the Pinterest pin of the drying rack made out of PVC pipe that slid into a cabinet. I didn't want to use cabinet space for something I only need infrequently, but I do need. So I went looking for an unused space. 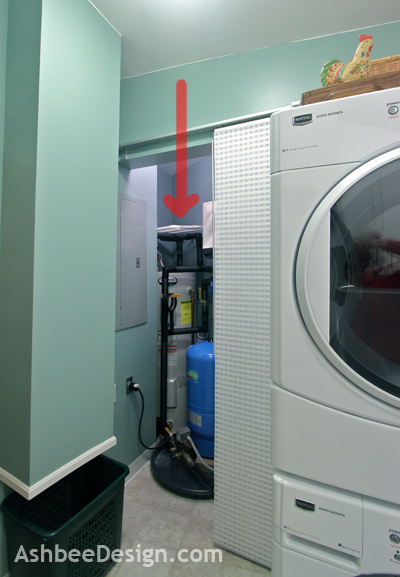 There, on top of the water heater in the utility room is an unused space. I made a custom rack from PVC pipe with nylon netting stretched over it. It fits right into the space and balances on top of the pipes. I can wash my delicate tops (of which I have very few. I have a rule about not buying delicates!) and lay them out on this drying rack, slide up into the corner and let them dry in their own sweet time. I'll do this with the sweaters as well, one at a time. Below is a photo of the drying rack on the folding table. I slide it back in to its high corner and wait for the garment to dry. Not totally convenient but a reasonable work around. 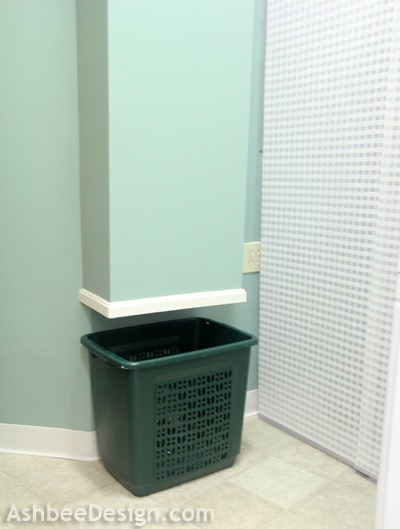 Someone asked if I had a laundry chute - sure do! But that isn't new, it was in the old laundry rooms as well. We did sheetrock it and paint it so it blends in. It connects to the upstairs bathroom which was the kids bathroom for years and a God send solution for sure. One mistake here though. When the room was still studs and insulation we didn't look above the insulation. 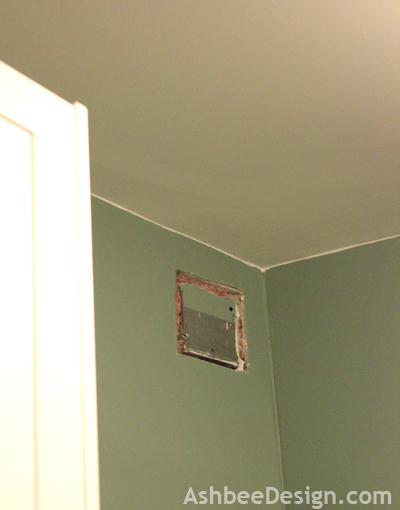 If we had we would have noticed the top of the laundry chute which cuts through attic space isn't insulated. This is a definite heat escape spot that we should have fixed. We know about it because the cold air pours down the chute. Also the flat wall of that chute is just calling out for some creative artwork. That is on the to-do list! When the electrician came to start working he saw this odd electrical box in a high corner and asked what was it for. We had no idea so he did some investigating and discovered it was the power line to our oven. We have no idea why it is there but it is and we can't cover it with sheet rock. We must keep access to it for current code. The contractor was willing to build a little door but I thought I could figure out something a little less obvious, and I did. 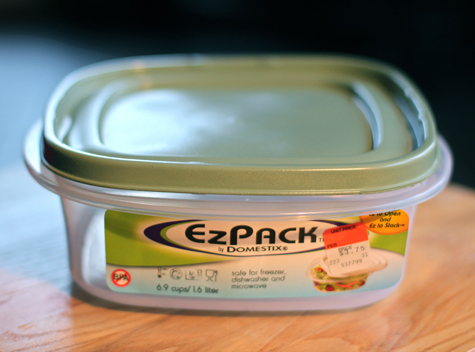 The solution was the lid to a storage container. I bought the container, spray painted the lid with plastic spray paint, put double stick foam tape on the back and stuck it to the electrical box. The price was right! 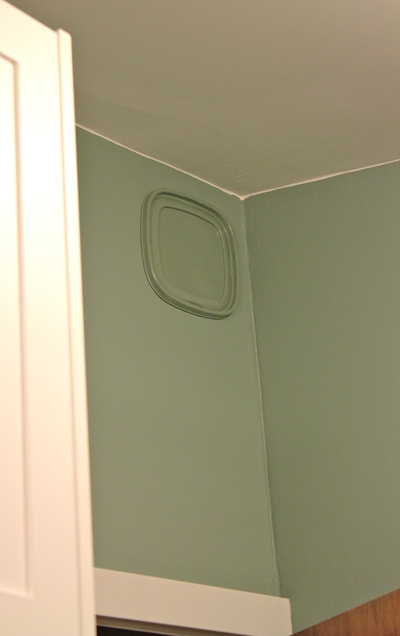 And it is a whole lot less visible than a little wooden door! 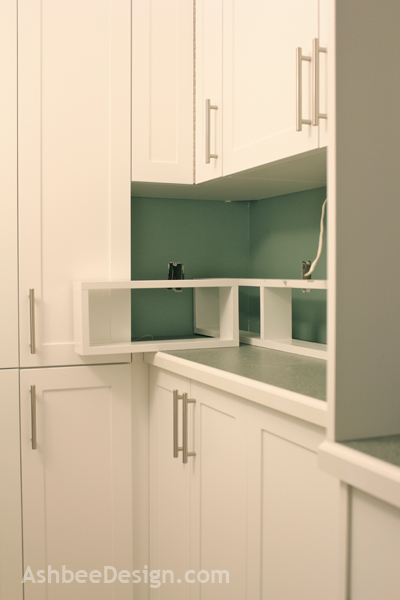 The space under upper cabinets back near the wall is prime show space. 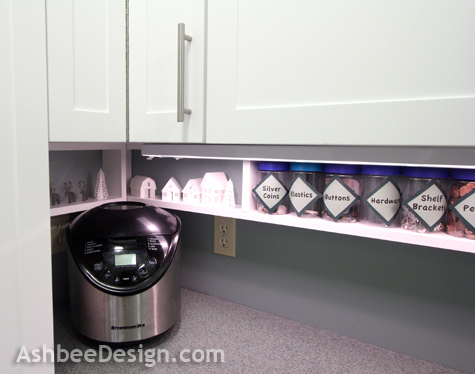 I had little shelves built for that space beneath my kitchen cabinets and I made my own for in the laundry room. I used the new miter saw I had to buy to complete the trim work in here and made wooden rectangles that I screwed into the bottom of the cabinet. I made the shelves the perfect size to fit a collection of plastic peanut butter jars I'd been saving for years. Now I have a place to put the assort tidbits I find in the pockets of the laundry. In our house she who does the laundry gets to keep the money found! This is the last of the highlights of my laundry room renovation. I will do one more post about the mistakes, things I would have done differently. There are a few and I know some of the most valuable lessons can be learned from mistakes! Stay tuned!